Q1. 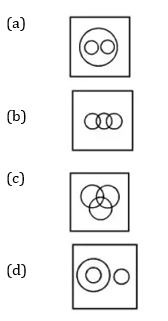 Identify the diagram that best represents the relationship among the given classes. दिए गए विकल्पों में से सम्बंधित शब्द/ वर्ण/ संख्या का चयन करें. 534 : 645 : : 381 : ? Q3. In a compass, west direction is shown as south. 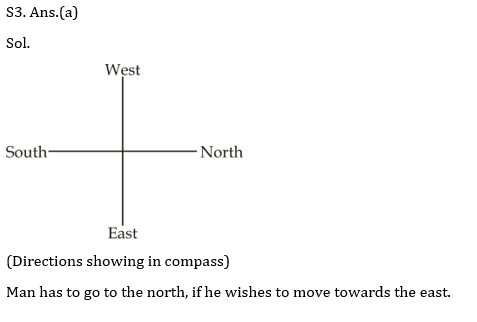 As per the compass, which direction should a man go to, if he wishes to move towards the east? एक कम्पास में, पश्चिम दिशा को दक्षिण के रूप में दिखाया गया है। कम्पास के अनुसार, एक आदमी को किस दिशा में जाना चाहिए, अगर वह पूर्व की ओर बढ़ना चाहता है? Q4. Akhil is the maternal uncle of Rashmi. Rashmi is the daughter of Ramesh. 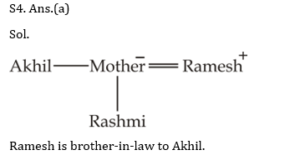 How is Ramesh related to Akhil? अखिल रश्मि का मामा है। रश्मि, रमेश की बेटी है। रमेश का अखिल से क्या संबंध है? Q5. 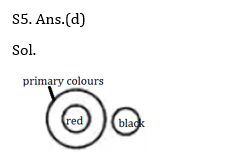 Identify the diagram that best represents the relationship among the given classes. Directions (6-7): In the following question, there are two statements followed by two conclusions I, II. Read the conclusions and decide which of the conclusions follow(s) the statements. Q6. Statement: No dog is a cat./ कथन: कोई कुत्ता बिल्ली नहीं है. Directions (8-9): Study the following information and answer the questions given below it. Eight friends i.e. 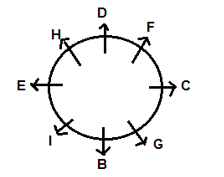 B, D, G, I, H, C, E, and F are sitting around a circular table and faces outside. B sits 2nd right of C. G is immediate neighbor of C. F sits 2nd left of G. D sits opposite of B. G is not near to D.F sits 2nd right of H. I is not near to H.
Q8. 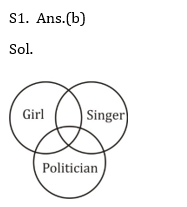 Who among the following sits immediate right of E? निम्नलिखित में से कौन E के ठीक दायें बैठता है? Q9. Who sits opposite of I? I के विपरीत कौन बैठता है? Q10. Who among the following sits 2nd left of G? निम्नलिखित में से कौन G के बायें से दूसरे स्थान पर है?